Inspired by his childhood memories growing up in North Philadelphia, Bill Cosby created the stories surrounding the lovable Albert Jackson and his signature salutation "Hey! Hey! Hey!" For Fat Albert and his friends, each day is an adventure as they face the exciting, and sometimes challenging, experiences of growing up in 1970s urban America. For these city kids, each day holds new lessons and surprises. They are a group of boys who, in spite of their shortcomings—whether it be an awkward growth spurt or a lack of athletic ability— always stick by each other. With Fat Albert as their leader and the junkyard as their playground, this band of misfits shows us that if you put your imagination to work, you can achieve anything! Fat Albert and the Cosby kids had a powerful impact on children across the country, entertaining and educating millions of kids and families alike while always fostering lessons in life, which were reinforced by Cosby's live-action hosting segments. The show was far ahead of its time, and more than 40 years after its original premiere in 1972, it still is. The show has a special place in television history and Fat Albert, Bill, Rudy, Weird Harold, Mushmouth, Dumb Donald, Russell and Bucky remain beloved by fans everywhere. Hey, Hey, Hey! I absolutely remember watching this show when I was a kid, even though this was before my time, I use to watch Fat Albert with my dad. I thought the show was so funny and entertaining and I loved that when I was a teenager they came out with a movie starring Kenan Thompson. Both the movie and television show was filled with comedy and songs and always taught you some lesson by the end of each episode. Filled with all 110 episodes including a documentary of the story of Fat Albert, this 15 DVD disc is definitely worth adding to my collection, it just reminds me of my siblings and I watching it on a Saturday morning and I love that this was a show my dad use to watch too. And now you too can get Fat Albert and the Cosby Kids on DVD in your home as it's been available since June 25th! Disclosure: All opinions are my own. 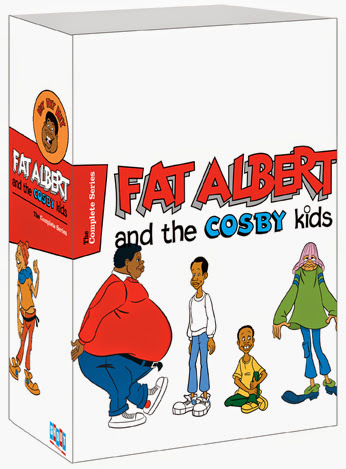 I received Fat Albert and the Cosby Kids The Complete Series on DVD at no cost for the purpose of this review. No other compensation was received.